We are dedicating a blog post to each of these walkthroughs. Today’s post focuses on the TimeWorksPlus Employee Portal. 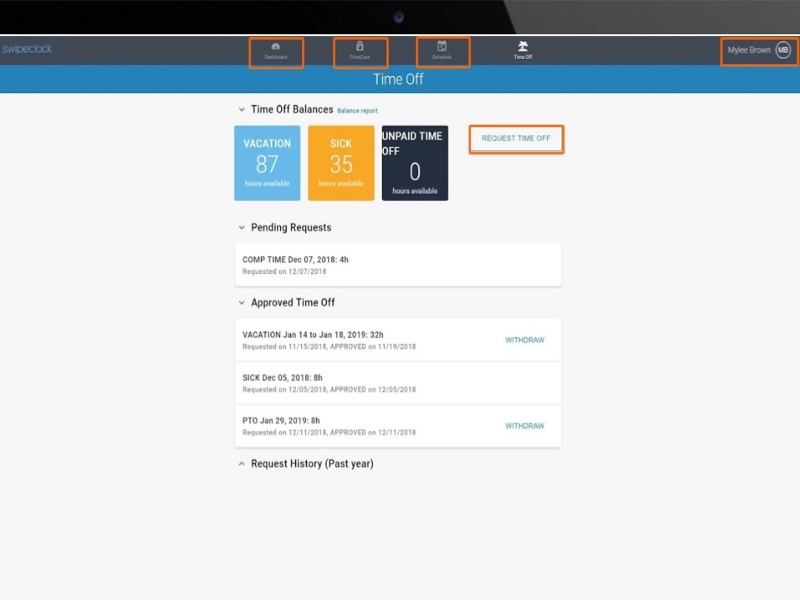 TimeWorksPlus is a cloud-based employee time and attendance system. Cloud-based means you don’t need to install it on your business computers. SwipeClock takes care of updates, security, and technical support. Showing is always better than telling. And one or two screenshots don’t cut it for TimeWorksPlus. With the TimeWorksPlus Employee Portal walkthrough, above, you can see every dashboard. Push all the buttons. Take all the time you need to learn how it works. You will be greeted by the EMPLOYEE login screen. It’s clean and simple. It contains everything you need and nothing you don’t. You can click the buttons on the screen to perform various operations. Or you can advance the screens with the arrows on the bottom. Log in to the system. The navigation bar along the top of the dashboard makes it easy to move around. Screen #2 is the EMPLOYEE dashboard. This is where employees punch in and see important announcements. It contains the TimeWorksPlus web clock front and center. Once you clock in, there is a confirmation of the time and punch type. If an employee missed their last punch, a button reminds them to correct it. Click on the MISSED PUNCH alert to see how easy it is to correct it. It pulls up a screen that lets the employee fill in the missing punch. The employee updates the shift and approves the change. Quick and easy. The TRANSFER function is invaluable for businesses with more than one office, store, or restaurant. Click on it to see how employees switch job sites. This is also where you track departments or positions. The MESSAGE box is to the right of the web clock. Employers use this area for important information. This ensures that everyone knows about events and announcements. The MESSAGE box can be used to administer an employee engagement program. For example, you can include updates on current projects or promote your wellness program. Consider the benefits of an online time clock. Employees can see exactly when they punched in or out. They know their punch was recorded in the system. It takes the guesswork out of an essential process. Are you currently using an old-school punch clock or paper timesheet system? How long does it take you to add up employee hours each week? How much time would TimeWorksPlus automation save you? Our clients report saving from eight to ten hours a week. Let automation take over the hours tracking. When computers do the calculating, you protect your payroll from human error. There is a 2%-3% error rate in manual data entry and calculation. Accurate tracking ensures payroll integrity. It also helps you maintain Fair Labor Standards Act (FLSA) compliance. Let’s talk about the time card screen. You get to it by clicking on the TIME CARD button on the top navigation bar. The time card layout is straightforward. Employees can easily see which pay period is shown. The hours worked each shift is in the right-hand column. What are the advantages of online time cards? With automated time and attendance, all punches are recorded in the system. Managers have access to their teams’ time sheets. This saves time for employees and managers. Employees don’t have to fill out a paper time sheet. Companies who use paper time sheets know that employees often forget to record hours. When time cards are due at the end of the pay period, there is a mad dash to get them turned in. When employees guesstimate hours after the fact, there is a higher error rate. This could be intentional or inadvertent. Either way, the employer loses. If you are using paper time cards, you know what a hassle approvals can be. Managers have to collect time cards that weren’t submitted. If an employee didn’t record a shift clock in or clock out, the manager needs to research and correct the problem. When employees add up their hours, it’s not always accurate. All of this back-and-forth is unnecessary in 2019. TimeWorksPlus is affordable and easy to use. In fact, it will save you money. Put an end to the time card scramble. Jump on board the express train to efficiency. HR teams field many calls about Paid Time Off (PTO). This is understandable. Even employees who like their job would rather be vacationing. The TimeWorksPlus ACCRUALS function makes life easier for employees and administrators. You customize this tool for your company’s PTO policy. Employees can monitor their accruals on any internet-enabled device. As often as they want. This ahead-of-the-curve feature improves employee morale more than most employers realize. Managers can see all time off requests in a centralized location. They don’t have to remember which requests they have approved. They can see when the requests were submitted. This puts all employees on a level playing field if you have a first-come-first-served policy. It eliminates the favoritism (or the appearance of it) that erodes trust. Click the employee name in the upper right-hand corner. This opens the employee information screen. Employees can update their information as needed. It doesn’t require a phone call or trip to the HR department. Basic information management is at the heart of enterprise efficiency. For information about customizing TimeWorksPlus for your business, visit SwipeClock.